Satin acetate ribbons will be printed in full color, edge to edge, with your custom information. The stiff acetate ribbon may be used for advertising, ceremonies, gift wrapping and brand awareness. If individual ribbons are cut from the 100-yard roll, you will get 600 6-inch ribbons or 450 8-inch ribbons. SET-UP FEE: $30.00 If you provide print ready artwork that does not need additional preparation for production, this fee will be reduced to $15.00 after review by a designer. PROOF: A proof will be provided for your approval showing the placement and spacing of your text and logo. PRODUCTION: 10 business days after proof approval. Satin acetate ribbon will be custom printed with your text, title and logo/design. There is no limit to the number of colors and no stamp fee. Rolls may occasionally contain splices. The printed ribbon is not washable. DESCRIPTION: 100 yards (300 feet) white 100% acetate ribbon with fused edges. Multi color printing on one side of the ribbon. The entire surface of the ribbon may be printed (edge-to-edge printing). 1. BLEEDS: If any portion of your artwork will extend beyond the edge of the ribbon, it must be set up with a 1/8 inch bleed allowance along both sides of the ribbon. 2. LIVE AREA: A 1/4 inch margin is recommended between important text or images and the edge of the ribbon. This does not include the background or design elements that are designed to extend off the ribbon. 3. IMAGE SPACING: Space between repeated logos will be the same length as the image itself unless specified (e.g., an image or logo that measures 6 inches will have 6 inches of space between each repeated image). 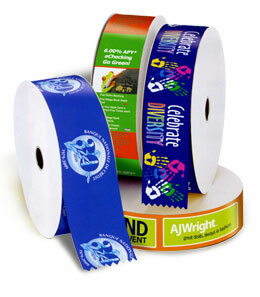 COLOR MATCHING: Full color ribbons are printed using a CMYK printing process. PMS colors that are called out will be matched as close as possible. Exact PMS or CMYK color match not available. For best results, supply vector artwork and call out PMS Solid Coated colors. Art files that are submitted as bitmap, .jpg or files with gradients cannot be printed with PMS values. PRICE INCLUDES: 1 roll of white satin acetate ribbon (100 yards) with multi color print on one side along the entire length. Ribbons will be cut to length by the consumer.